Top O' Texas Monument Company wants to help you find the right monument to express the achievements of a lifetime. We offer single monuments, companion monuments, child monuments and veteran monuments in various designs. What better way to show how important your loved one’s life has been than with a quality monument. 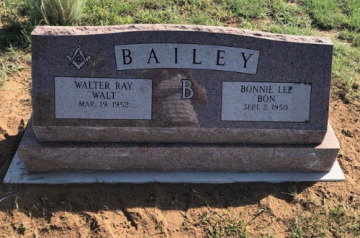 If you're unsure as to which type of monument to choose, Top O' Texas Monument Company can help you decide what monument material best suits your needs including granite, marble and bronze. It's always our goal to help you create a memorial to beautifully celebrate the life of your loved one. Please take a moment to explore our range of headstone types below. For more details, please call us today at (806) 665-4884. This style of monument utilizes a large front face (or tablet), and are a good choice for long, engraved inscriptions or flourishes. The large tablet size also makes it easier to locate in a cemetery. 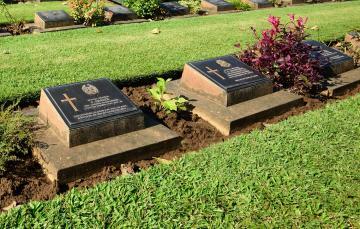 Companion monuments mark a dual cemetery plot and showcase a family's name. The monument uniquely represents the family's name. Each one is carefully crafted to create a meaningful tribute to honor the family. As you can probably tell, this style of monument rests very low, or flush to the ground. 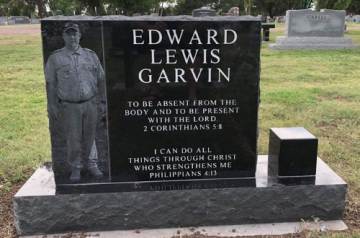 There are some cemeteries that require this type of monument to be used for both a uniform appearance as well as ease of mowing. Often used as a memorial as well as a grave marker, bench monuments are often seen as a comforting place to sit peacefully and reflect on memories shared. To add additional beauty and protection to your loved one's grave site, we offer ledgers and coping walls. Ledgers are a unique monument style that refers to a flat memorial that often extends that entire length of the grave site and can be engraved with lettering and designs. Coping walls are barriers that outline ledgers for additional protection and definition. 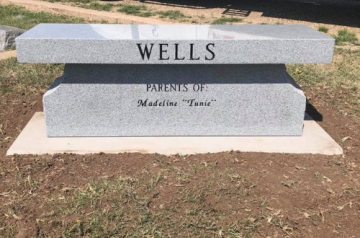 Here at Top O' Texas Monument Company, we provide our clients with custom work to help you achieve a very specific look for your monument. 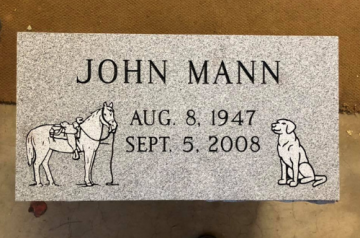 With techniques that include laser engraving, we can help you accomplish personalized designs that will beautifully represent your lost loved one. 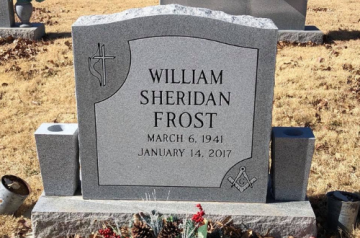 Often used for public memorials and veteran monuments, bronze is a rich, striking material that adds warmth and comfort to any headstone. We provide bronzen flat memorials to serve as beautiful emblems for lost loved ones.